Recently at a Cross Party Group meeting held at the Scottish Parliament it was stated that “depression is under-recognised across all age groups” and that “maintenance treatment has a good risk-benefit ratio.” This was said without acknowledging that these statements cannot be made with absolute certainty. I have found that my profession in Scotland seems to resist evidence of experience and at the same time prioritise the opinions of experts. There is evidence that establishes that senior Scottish psychiatrists, who have provided expert input to Scottish Government strategies, and who have been involved in developing National prescribing guidelines, have had significant financially-based vested interests. It is worth perhaps pointing out that Scottish Psychiatry has been traditionally orientated around biological determinants of mental health. Like myself, many academics have concluded that Scottish psychiatry lacks real-world, pluralistic breadth to the science of the mind and brain. Across the border, in England and Wales, the approach is far less reductionist. This includes the involvement of experts whose interests are not solely focussed on the bio-medical determinants of mental health. I do prescribe psychiatric medications including antidepressants but I do not agree with the ‘experts’ that prescribing in Scotland is “conservative”. 1 in 7 Scots are now taking antidepressants. Appropriate and informed prescribing is what we seek where there is open discussion about the potential benefits and potential harms of such treatments. This and an honest consideration that for many medications we cannot be certain of long-term effects. Date of submission: 3rd June 2017. I am writing in support of this petition. I am an NHS Consultant Psychiatrist who has worked in this specialty in Scotland for almost 25 years now. My wife has worked as a General Practitioner in Scotland over the same period. I have an interest in ethics, human rights and the medical humanities generally. One of the areas I have taken much interest in is informed consent. I would argue that this backdrop may mean that I can add some thoughts and reflections that might help the Committee in the consideration of this particular petition. I should make it clear that as an NHS psychiatrist I do prescribe antidepressants and other psychotropic medications. I try to do so following the best available evidence as considered as relevant or not to my professional understanding of each unique patient and their life circumstances. • Antidepressant prescribing In Scotland (ISD figures) has been rising year-on-year in Scotland for at least the last ten years (this is also true of all other prescribed psychotropic medications). It is estimated that 1 in 7 Scots are now taking antidepressants and many of these in the long-term. • A key opinion leader and Government advisor has previously argued that prescribing of antidepressants in Scotland is “conservative” and “appropriate”. 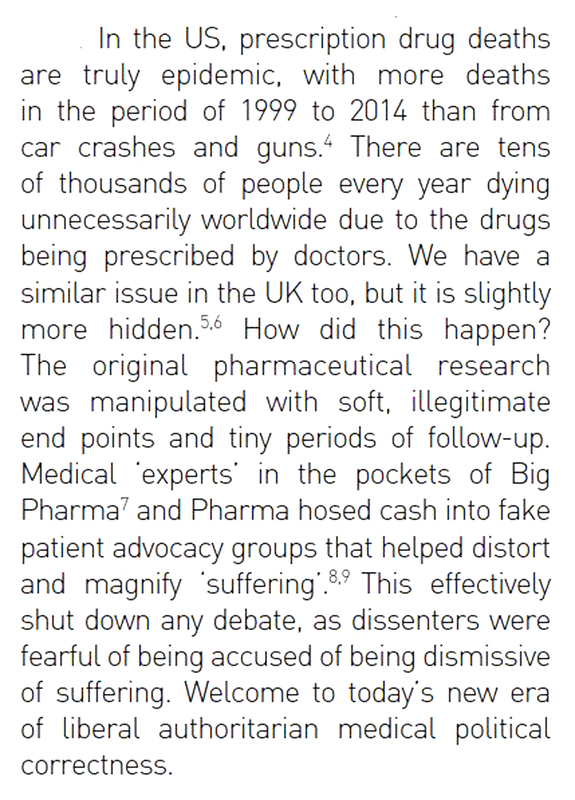 • Many of the key opinion leaders “educating” doctors prescribing antidepressants in Scotland appear to have significant financial interests with the makers of these medications. 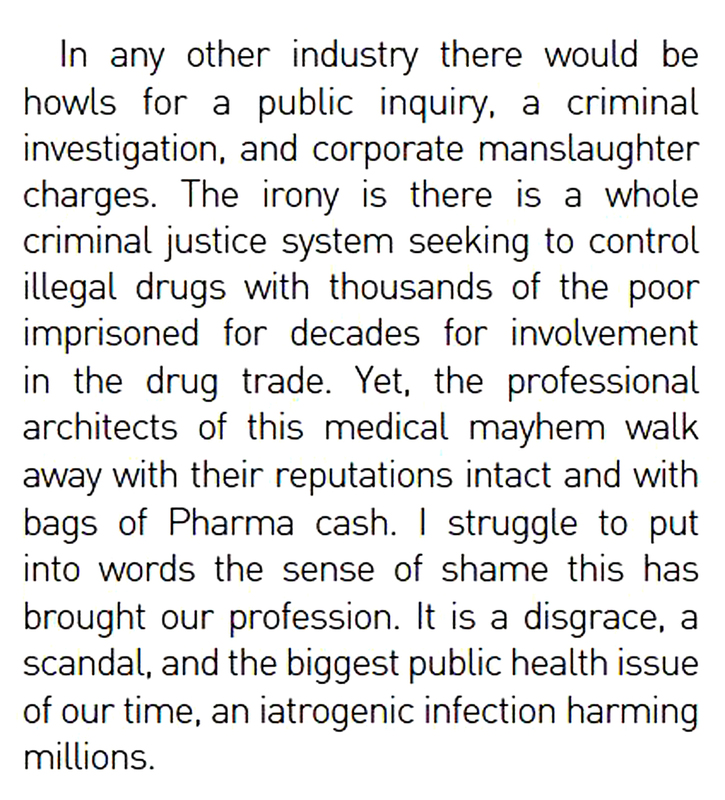 Across the UK, £340 million was paid by the pharmaceutical industry in the last recorded year to healthcare workers and academics for such “promotional activities”. • “Informed Consent” will not be possible if the information that doctors base prescribing on follows such promotion rather than independent, and more objective, continuing medical education. This issue is now at the fore of the Mesh Inquiry. When patients are prescribed antidepressants are they informed that as many as 1 in 2 will be taking antidepressants long-term? Are patients informed that there may be a significant risk of pharmacological dependence on antidepressants? Do patients know that their experience of antidepressants may be considered less valid than the experts (who may have been paid by the pharmaceutical industry) who educate other doctors (who may be unaware of this potential financial bias)? 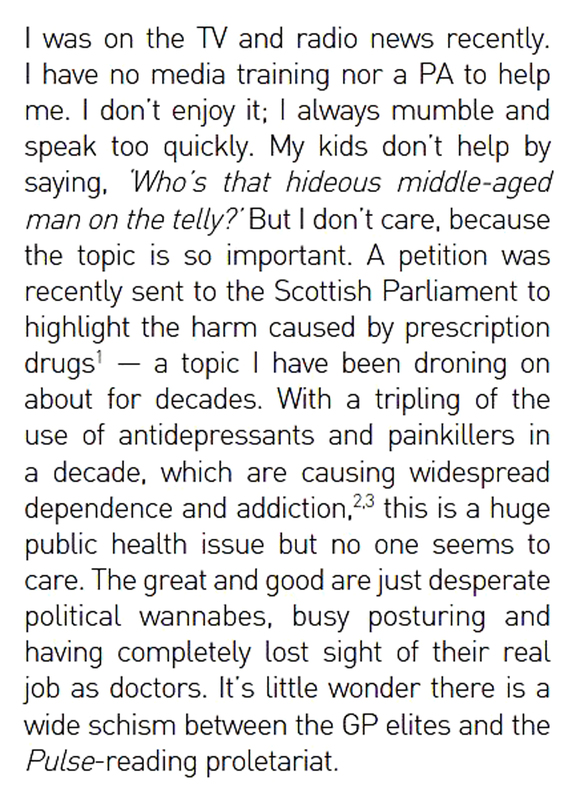 My view is that antidepressants are over-prescribed in Scotland. My view is that patients have not been properly informed of benefits and risks. 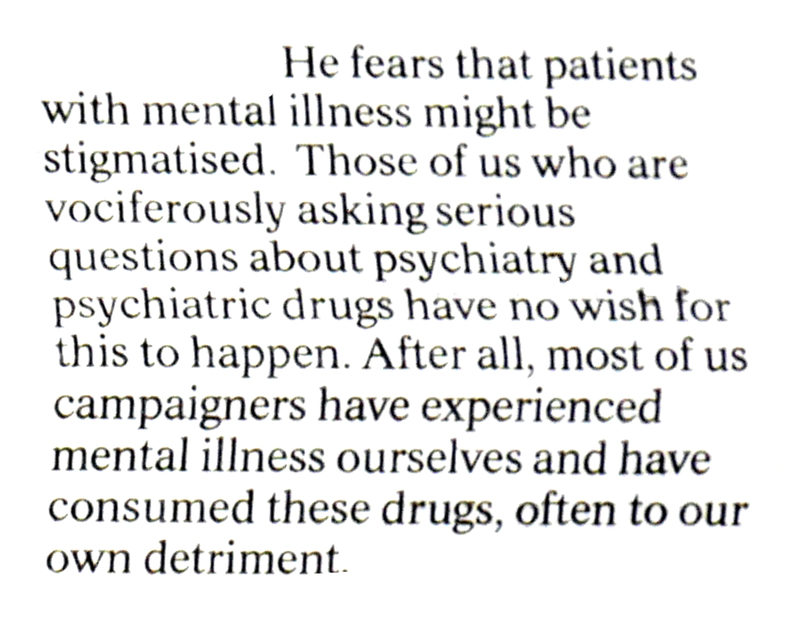 My view is that appropriate prescribing has not been realised due to a number of factors: the lack of access to psychological therapies or other meaningful supports; the wide promotion of antidepressants where marketing is routinely conflated with education; and a culture of increasing medicalisation generally. I would suggest that this petition might be considered in light of the Chief Medical Officer’s Realistic Medicine campaign. It is time for balance to be re-established between “medical paternalism” and the valued, vital and real-world experiences of patients who are taking medications like antidepressants. I am particularly disappointed in my own College, the Royal College of Psychiatrists for not making greater effort to facilitate such balance. Without such, I fear more harm will result from inappropriate and costly prescribing in NHS Scotland. Finally, due to widespread “off-label” promotion of antidepressants in Scotland, patients may experience withdrawal syndromes which can be most severe and precipitate mental states far more serious than the mental state for which they may have originally been prescribed. I would urge the committee to consider this petition most carefully and to seek balance in their appreciation of where expertise rests. 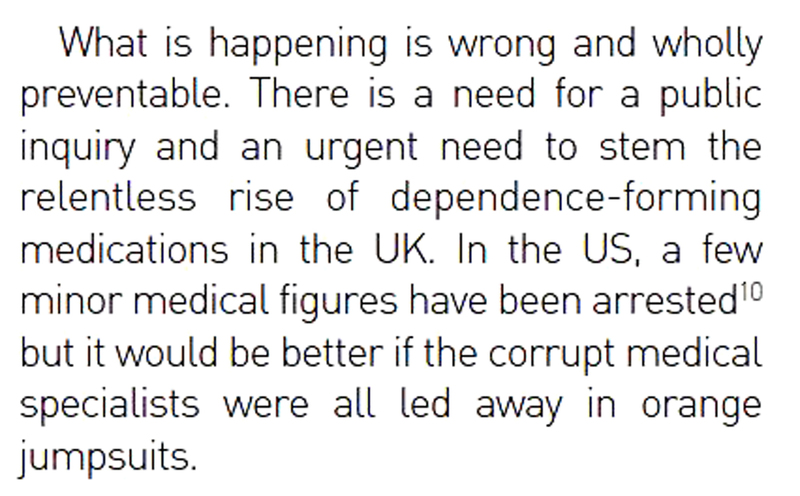 The following is a recent opinion piece by Dr Des Spence published in the British Journal of General Practice. I had been lined up to do the media interviews on BBC Scotland in relation to petition PE1651. However, on the day, due to changed travel arrangements, I was not available. Dr Des Spence was interviewed instead and did a better job than I could have done. I have submitted my response. I feel it would be helpful to hear the views of the Chief Medical Officer for Scotland and in particular, how this matter might be considered as part of Realistic Medicine. I have previously raised my own petition, PE1493, which the Scottish Public has supported. This was a petition for a Sunshine Act for Scotland, to make it mandatory for all financial conflicts of interest to be declared by healthcare professionals and academics. My petition, supported by the public, had no support from “Realistic Medicine”. The public has had no update from the Scottish Government on my petition in 18 months. My view is that this is a shocking failure of governance and would seem to demonstrate a lack of respect for democracy. If this headline represents the approach of the Scottish Government, well I worry. It is doctors, not pharmacists, that are licensed to prescribe and to withdraw any prescription. The scientific community shares the conclusion that it easier to start medications than to stop them. “stricter checks on medication involving addictive medications”. that withdrawal from psychotropic medications may precipitate (for some) a “relapse” with symptoms worse than those for which medication was first prescribed. that long-term exposure to psychotropic medication may have unforeseen consequences. I am a worrier and I worry.